Here is the card I made for Cricut Challenge #1 (11/10/08). For this challenge we were to make something (card, LO, tag, etc) using the colors pink, light green and white. 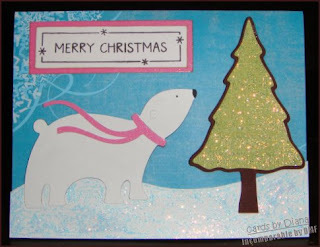 Polar Bear - JOTS @ 2"
Tree - JOTS @ 3.5"
Glitter - Stickles...lots and lots of stickles. Hello! Here is a card I completed on Sunday. 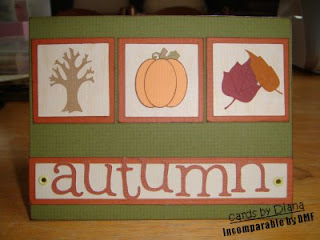 For whatever reason, I feel like making Fall cards. Fall is such a beautiful time of the year. 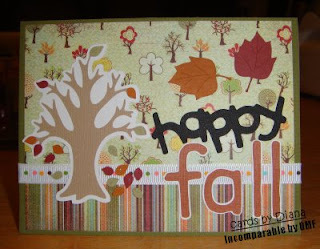 tree/leaves: SYI @ 3" .. happy: WIMG @ 1" .. fall: Pooh font @ 1.5"
my first autumn card! it is called a Square 3 card and this one was inspired by a card made by Okieladybug. tree: SYI @ 1 1/4"
pumpkin: George Ovals @ 1", SYI leaves/stem @ 1 1/4"
leaves: SYI @ 1 1/4"
Here are some my favorite halloween cards that I made this year. Normally I don't make or send halloween cards, but I was inspired by the Cricut Messageboard and Paper Doll Dress Up (PDDU) Cricut Cartridge. These are the first cards I made with PDDU. This cart is amazing! When I think of the Paper Dolls Dress Up cartridge, I think of FUN FUN FUN! It is so cute and so easy to use! The cuts for the dolls are easy to follow, but the best part about this cartridge is the additional accessory cuts! 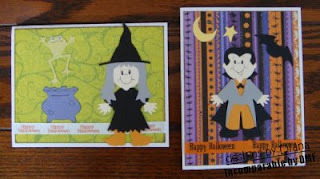 For example, the cowboy has the cutest cow...the halloween monsters has a scaredy cat and spider and ghosts. The princess has a dragon and castle...Santa Claus has a sack for presents and a sleigh. So each of the dolls has all their accessories. There is so much on this cart! Each time I look through it I find something that I didn't know was on it! For the witch and vampire cards: paper - K&Co Halloween mat stack, ribbon - from Michaels, witch/vampire/accessories - PDDU 3.5". 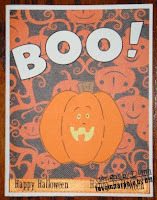 Another halloween card is this "boo!" card. The paper is K&Co halloween mat stack, ribbon is from Michael's, "BOO!" is mickey font at 1.5" with shadow and pumpkin is from PDDU. Hello! Welcome to my blog! I will be posting my scrapbooking projects here. Check back soon!